Brunswick Chiropractic Center of NJ | Begining you on your journey to optimal health – naturally through Chiropractic care! Begining you on your journey to optimal health – naturally through Chiropractic care! 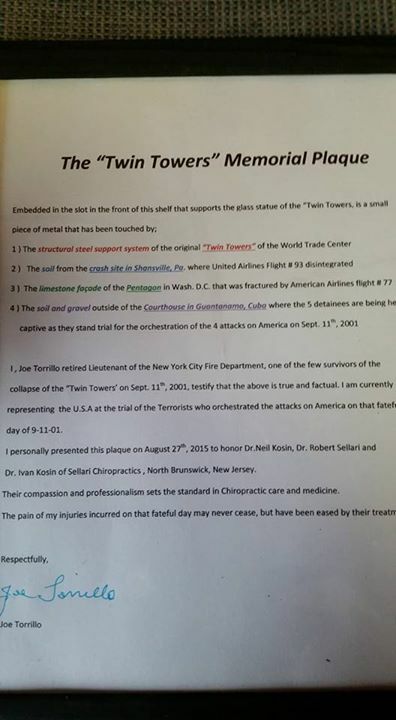 I can’t believe that it has been 14 years since that harrowing day when the world was changed forever! Let’s give homage and praise for all the heroes that day. 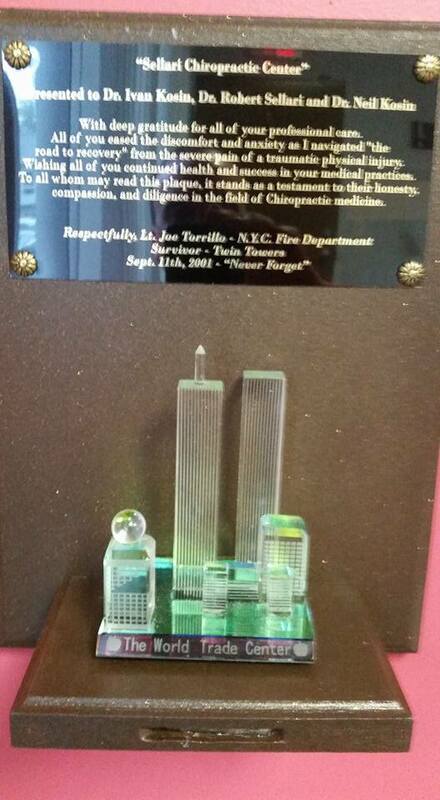 The Twin Towers Plaque was presented to my office by a patient that is a true American hero. 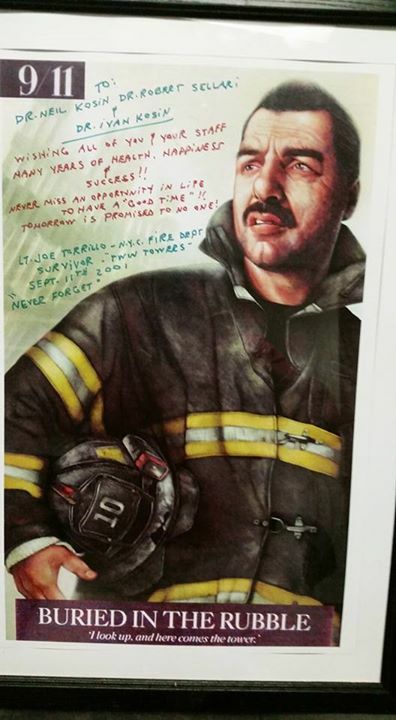 Lt. Joseph Torrillo (former fireman) found buried in the rubble is only 1 of 4 individuals that survived the collapse of both towers. We are grateful for his bravery and service! God bless all the NYC responders and GOD BLESS AMERICA! Electrical stimulation therapy is used to relieve headaches, shoulder pain, neck pain, back pain as well as pain in the extremities. The therapy works by stimulating the muscles with a mild electrical current. Electrodes are first placed at the appropriate points on the patient’s skin. We begin the therapy with a low setting and increase the frequency until the patient has reached their comfort level with the electrodes. Then the patient is allowed to be in this relaxing therapeutic state for 10 minutes or longer, depending on what our chiropractor prescribes. Ice packs are also placed over the electrodes to further ease the pain and reduce the swelling. This therapy works by causing a relaxation of tense muscles and an alleviation of the swelling that is frequently involved. Most of the time, we do not think of pain in terms of inflammation, but for the most part, that is precisely what causes pain. After a few visits, the inflammation in your muscles and nerves will be gone altogether or significantly reduced. Dr’s Kosin may also prescribe massage therapy and a nutrition plan to speed up and aid rehabilitation for patients. Electrical stimulation treatment is one of the many state of the art therapeutic techniques we have available at our Freehold NJ and North Brunswick NJ Center. If you would like to know more about this therapy or the other services we provide, we invite you to call us at 732-407-7744 or 908-753-5454. Our office is conveniently located at 1594 Route 130, North Brunswick, NJ. Need a new mattress? click on link for helpful tips! People sometimes ask me, “How did you get involved in chiropractic care?” I tell them it all started one day when my mother went to a Chiropractor and I had nothing else to do that day so I decided to go with her. My life has never been the same since. Little did I know that this 20 minute visit would have such a profound effect on my life. The Chiropractor explained to me how everything in our bodies was controlled by the nervous system and how people didn’t need to be in pain to be sick or hurt. I realized then, why should people be in pain when they needn’t be? I wanted to help people achieve their optimal health naturally, and the best way I could achieve this is by becoming a chiropractor. So, thanks, mom! Why chiropractic care for you? The optimal goal of any visit to a chiropractor is to diagnose, treat and prevent misalignment of the spine (vertebral subluxation) resulting in proper function as well as the body’s ability to heal itself without the use of medications or surgery. Regular spinal adjustments are essential to maintain normal health, and Chiropractic care can treat conditions most people don’t even realize they suffer from. When you first arrive at Brunswick Chiropractic Center of New Jersey, I will perform a comprehensive medical history, evaluate your condition, and may use diagnostic imaging to determine what course of treatment is appropriate for the individual—which is key! Here you will receive personalized care and attention needed to guide you to better health. If your case is one that I feel will benefit from Chiropractic care, I will tell you. And more importantly, if it is not, I will tell you that, too. Please call or email Brunswick Chiropractic Center of New Jersey anytime so we can discuss what your specific health goals are and begin you on your journey to optimal health—naturally thru Chiropractic care!